Oh my word. (This is a Southern pie, so naturally I have to start this post with a Southern expression.) The past few days have been the happiest kind of whirlwind, for reasons I can’t wait to share with you all in the coming weeks. As I’m writing this I’m so full and content and dazed that I’m not sure I’m in a fit state to write this for you all! So I’ll keep it short and just share with you something to soothe and calm, amidst all the excitement. For those of you who are new to chess pie, this little blurb by Southern Living perfectly sums up all you need to know, including the theories behind its funny name. Mine is a fairly standard recipe for the Southern classic, but with a teensy twist (and made miniature, surprise surprise). By infusing the cream with chamomile and thyme, the resulting custard is smooth and sweet, but with faint floral and savory notes that I found irresistible. The tricky thing about making this mini is that does require you to prepare at least a few tablespoons to 1/4 cup more cream than you’ll end up using — I couldn’t think of a way to infuse the flavor sufficiently otherwise. I found a use for the extra cream by doubling the recipe below to make the four pies shown (and it gave me the chance to tweak the proportions to the right consistency of custard), but I think the extra cream would have been lovely too in tea or coffee, or used to add just the faintest flavor to ice cream. If you’re loathe to waste cream, you could brew tea with the thyme and chamomile, chill it or freeze it, then use it to flavor the pie crust instead. Finally, note that you’ll need at least an hour of chilling time for the pie crust, and you’ll also need to prebake the crusts, so give plenty of time for this or prepare the dough the night before (or on a separate occasion and freeze). Enjoy! And, on a separate note, you can find my little recipe for Chinese tea eggs up on Food52 today! 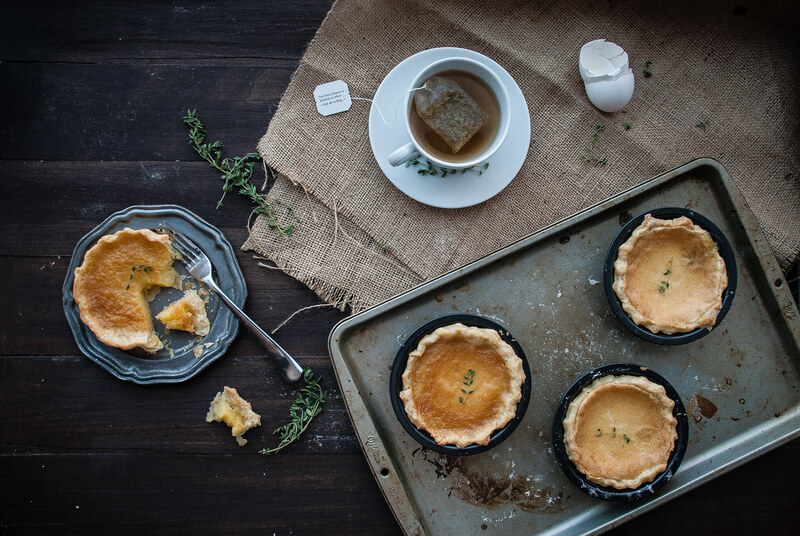 Chamomile thyme miniature chess pies. Yields two 5-inch pies, using these pans. 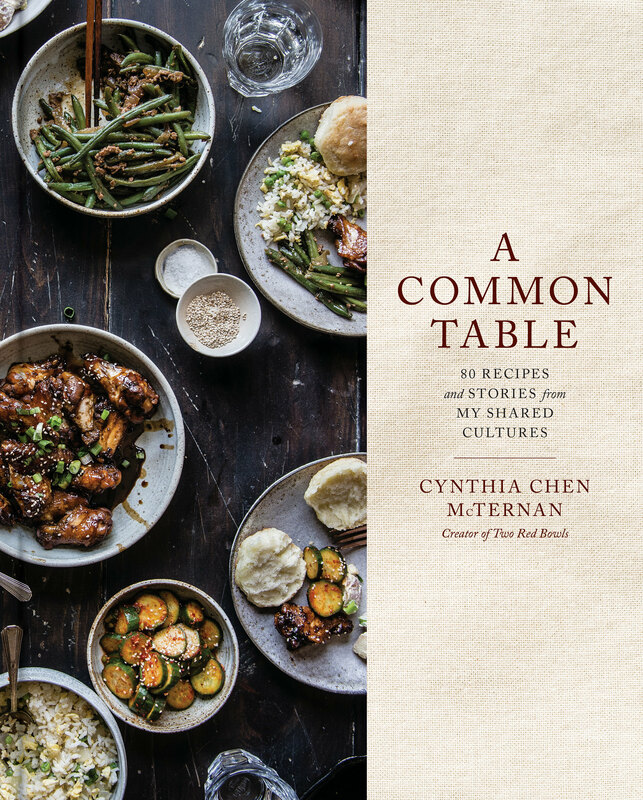 Inspired by Michelle at Hummingbird High's Meyer lemon chess pie, in turn adapted from the Four and Twenty Blackbirds recipe, and by Adrianna at A Cozy Kitchen's chamomile buttermilk pie. Sift together the flour, salt, and sugar in a large bowl. Using a box grater, grate the butter into the flour (using the largest holes), or cut it into small cubes. Cut the butter into the flour or just use your fingers until the butter forms pea-sized clumps in the dough. Add the water, making sure it's very cold, and stir with a spoon until the dough comes together. Give it a little time (and use your hands to press the dough together if need be), but if it remains too dry, add a teaspoon or two more water. Form into a ball, wrap in plastic wrap and chill in the refrigerator for at least an hour and ideally overnight. You can also freeze it for later use. Next, you'll need to roll out and prebake the crust. Divide the ball into two equal pieces, and roll back into a round ball. Starting with a round ball of dough makes it infinitely easier to roll it into a good circle. Lightly flour two pieces of parchment paper, and place one ball in between the two pieces, returning the other to the fridge to chill. Gently roll out the dough, using the rolling pin in one direction (outward) only, and rotating the dough with every roll to ensure it's rolled out evenly. Ease up the pressure as you roll outwards so that the crust won't be too thin on the edges. When you turn the pie pan upside over the crust and the crust extends at least 1/2-inch on all sides, it's large enough. Press the crust gently into the pan, and crimp and prepare the edges as you prefer. Cover with plastic wrap and place in the freezer as you prepare the other crust, then let the other crust freeze as well. Meanwhile, preheat the oven to 425 degrees F. When the crusts are frozen and hard to the touch, remove from the freezer and line tightly with foil, covering the edges of the crust. Place pie weights (read: for me, regular old pennies and nickels) in the bottom, taking care to line evenly. Bake on the bottom rack of the oven for 10-15 minutes, or until edges of the pie are set but not browned. Lift out the pie weights (the center of the crust will still look underbaked) and let the crusts cool while you prepare the filling. Preheat your oven (or adjust your oven) to 325 degrees F. In the smallest sauce pot you have, combine the heavy cream, chamomile, and thyme over low heat. Heat the cream for 4-5 minutes, stirring continuously, until cream is warm and heavily flavored with the tea and herbs. (It will be quite diluted in the custard.) If the cream begins to bubble, remove immediately from heat and simply let it steep for a few minutes off the heat. Pour the cream through a fine mesh strainer to strain out the chamomile and herbs, and place in fridge to cool. In a medium bowl, whisk together the sugar, cornmeal, flour, and salt. Add the melted butter and stir until incorporated (the consistency will be like wet sand). Beat the egg lightly, then add it to the mixture and whisk briskly until the filling is thick and light-colored, about 2-3 minutes. Stir in the heavy cream and whisk again briefly until incorporated. Finally, divide the filling evenly between the two shells. Bake on the middle rack of the oven for about 25-30 minutes, or until the tops are golden brown, the edges are set, and the center jiggles very slightly but is not liquid. If the tops are browning too quickly, cover with foil for the last 10 minutes of baking. Remove and let cool completely, then serve! For the crust, I used Courtney's ever-reliable recipe and tips, but only a quarter of the full recipe. You may find it easier to make a full batch and freeze portions, as I tend to do from time to time. I also consulted Adrianna's helpful guide (especially for the tip on grating butter), and Michelle's instructions on prebaking. These are absolutely gorgeous! Love the combination of flavours. My oh my oh my oh my oh my! 🙂 Sorry, I had to. How darling are these! What a genius combination of flavors– I love both chamomile and thyme (probably my #1 go-to herb)…they just sound so melodic and tranquil together. Can you believe I’ve never had chess pie? Why is it called that? And I am excited to hear all about your wonderful news! 🙂 Have a great day! You’re moving to Atlanta.. that’s the big news isn’t it? LOL You already know I love these little beauties.. I mean chess pie was like every other Sunday after church.. Love the flavors of these.. Chamomile is so soothing.. Can’t wait to try. i was just thinking about chess pie the other day, specifically KY Horseracing pie, aka chocolate chess pie, that dw makes. he’s the pie guy in our relationship and i think i will request that he make it miniature like these, cus we don’t need full size sweets in our house. I just made my first ever chess pie on Pi Day! (3/14.) A lemon chess pie. I was worried the 1 Tbsp of cornmeal it called for would be too gritty so I used tamale masa instead and it turned out great! 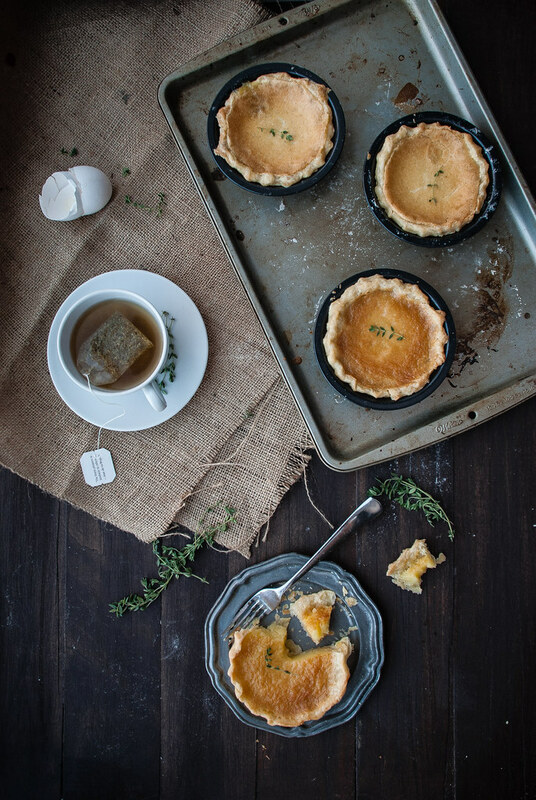 I doubt I’ll ever (be allowed to) invest in mini pie tins along with all my other ones, but your pies look adorable and I’m intrigued by the chamomile infusion! Ooooh what an awesome substitution! It’s funny about the cornmeal isn’t it? I was surprised to see it too but it really melts into the pie somehow. I bet your lemon chess was de-licious! Ha I love the name too!!!! 🙂 some theories do say it’s related I think, but who knows 😉 thank you so much, dear Christina! I can see why you would feel satisfied after this pie…delicious and beautiful…and lovely photos. So kind — thank you so much. The combo. Wow! You know, we Italians are a bit too stuck up on our own things and nobody would ever dream of combining these kind of flavors. This all sounds incredibly interesting to me. I don’t make/have pie often, but next time it has got to be this one. I am so happy I got to discover so many cool flavors in NY. My favorite combos were probably from Victory Garden, and this makes me think of that place a lot! Now, I don’t know what is causing you to be so happy, but YAY HAPPINESS! 😀 I swear I was smiling reading the whole post! Can’t wait to know what it is. Great job on this post! Haha! It’s funny, probably the only reason I can come up with flavor combos like these is (well, first, because I’m inspired by folks like you who are way more creative than I am, and) because I have so little experience with them and don’t know the rules. 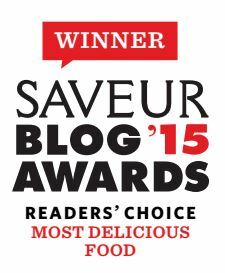 It’s been so fun isolating each and really familiarizing myself with their flavors! Also, you’ve definitely just introduced me to Victory Garden! Checking them out now … yay for new discoveries! Finally, you’re so sweet and I’m so touched by your kind words, Valentina! Once you find out the news you’ll probably think it’s silly I kept it so vague, but I wanted to figure out an appropriate food homage, as is our way as bloggers, right? 😉 Thank you so much, kind friend! Floral and savory taste together – thats amazing combination! 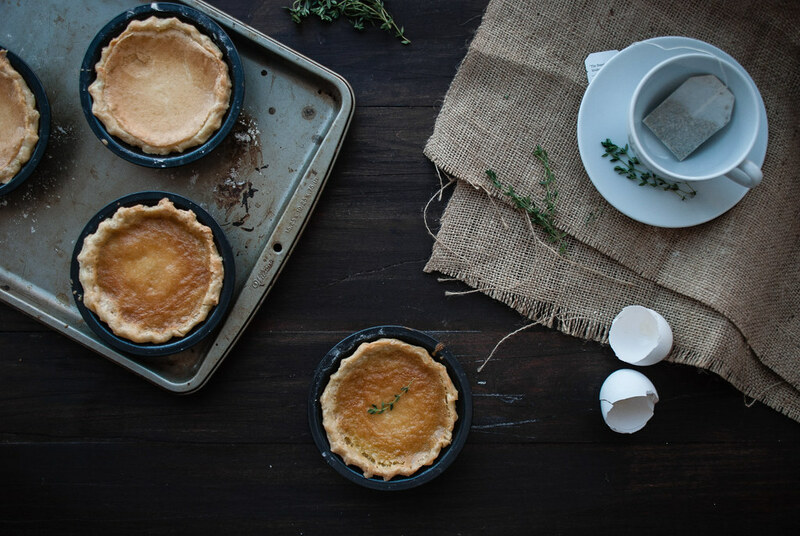 Love these little pies – beautiful! OH MY GOD YOU ARE SO CREATIVE. As you saw on my insta 🙂 I just made mini cakes the other day and it just reminded me how TOTALLY AWESOME small batch baked goods are!! Like on one hand, I’m like “should I really turn on the oven for these tiny things” and “if I’m going to cream butter, I might as well make the whole freaking pie” but then again, I’ve seen so many recipes for chess pie and have been like “oh hell no there’s no way I’m making something with 4 cups of butter + 10 cups of sugar.” In comparison, small batch chess pie almost looks like health food! …no? Anyone? If I made these, they would not last more than 10 minutes. And Erik would have to hide his to stop me from stealing half. As always, GORGEOUS photography <3 <3 <3 You amaze me! You are so very sweet, Sini! So glad to call you a blog-friend. 🙂 Thank you! 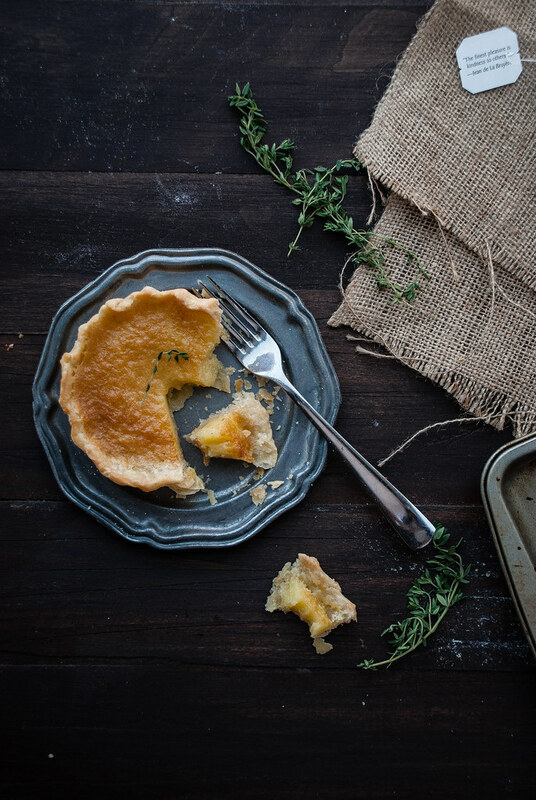 Such a great weekend project – I love the herbs to dress up the chess pie. I was just in the South but didn’t eat any pie – and I was there for Pi(e) Day – such a fail. I am so happy for your mysterious happy news 🙂 And um, someone please get this girl a cookbook deal because I totally need a small batch baking cookbook! I love, love, love that you mini-fy everything!! And you didn’t get engaged, did you?!?! Is that a really far off guess? (I guess you probably wouldn’t keep it so hush-hush if you did). Whatever the case, congrats lady!! to your, “oh my word” i say, “bless your heart, dear” another southern saying i hear whenever i visit my in-laws in north carolina! 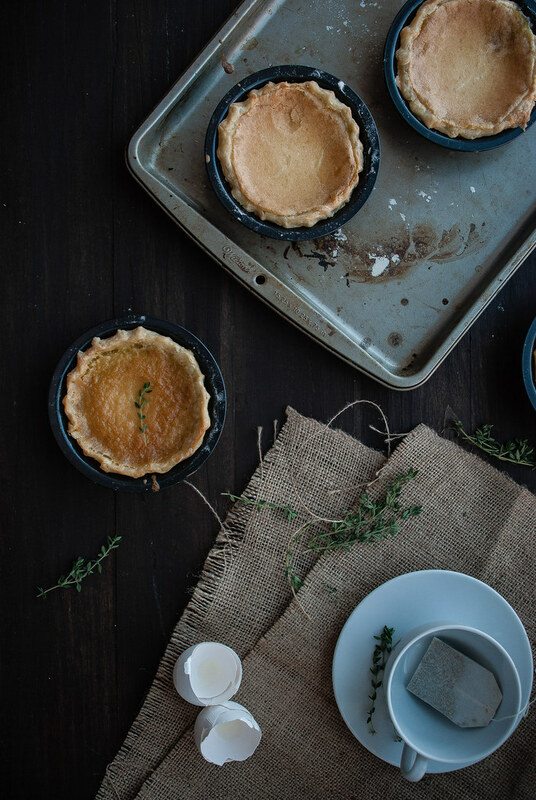 cute pies, girl – never had a chess pie, but the miniature-ness of them is quite enticing 🙂 looking forward to hearing your news! HAHA yes!! Oh boy, it’s been a hot minute since I’ve heard that one, but it rings so clear in my mind when you say that. And thank you, lovie <3 I will never cease to be amazed by how wonderful and supportive everyone is, it's just nuts in the best way. Thank you for everything! oh my… I am intrigued. What beautiful pictures and pies! Such an interesting combination of flavors. I would love to try them. Hurrah for exciting times! And for pie to calm us down after all that excitement. Love love love the chomomile/thyme flavour combination – so unique and so delicious. Plus the photos are, as ever, totally stunning. I am new to chess pie, so thanks for introducing me! Your mini versions are so cute and look so tasty! I’m glad you are so happy – can’t wait to hear why!! these look so fancy yet humble in a way.. They really are very humble! One of the main theories is that “chess pie” comes from “just pie” — a regular old pie with nothing fancy about them 🙂 and yet still so tasty! delish and presentation just perfect. So kind — thank you so much! And…can’t wait to hear your news – content and dazed news must be good news. Oh my gosh, me too!!! I have never met a tea-infused thing I didn’t like. Darjeeling sounds soooo good. <3 Thank you so much for your kind words! Yummy, these look great! Can’t wait to hear your news, sounds exciting! P.S. Also, huge congrats on your delicious Chinese tea eggs making it on Food52!! Yaaay!!!! I’ve never had chess pie but these sound and look delicious. Love the miniature size!